I had my eye on this for Christmas but in the end decided it would take up too much space. Ebony would absolutely love it though. I have a homemade one when I was little. So homemade that it would quite often collapse on me mid-performance, but I loved it. I always love the look of blackboard walls in playrooms, but I find that chalk creates a lot of dust and can be quite messy. I think a whiteboard wall would be just as much fun and wouldn't create so much mess. It would also keep the room light and bright which I think it important in a playroom. There's a big white wall in the playroom that would benefit from a bit of colour. I love the idea of framing Ebony's artwork to put on display. We currently have a noticeboard above the fireplace but it looks a little untidy and there's so much 'art' on there that nothing stands out. Ideally, I'd buy about six of these big frames and then frame some of her pictures. It would be easy to freshen up the room then too by simply changing the pictures. I'm hoping to get around to this at some point soon because I think it would look amazing. The other day, Ebony said to me, "Mummy, can I have a desk one day? Please?" Poor child. She has a table, but this is not the same, so now she wants a desk. I love the colours on this one from Maisons Du Monde. We definitely don't have the room for this, but how amazing would this be! I find we don't use the garden much during the winter and it's easy to end up with cabin fever during rainy school holidays, but this would definitely solve that. I always wanted a little one of these when Ebony was little, but I love the look of this big one even more. It would look great in the playroom but also I think the girls would be able to find lots of inventive ways of playing with it. The playroom is usually a mess. It is full of toys and dressing up outfits and craft things and all of these end up strewn across the floor. I have spent way too much of my mothering years tidying it or trying to cajole Ebony into tidying it. It seems, however, that five might just be the magic number. Five-year-olds, it seems, can actually keep their playrooms tidy. I never thought I would see the day. Ebony is obsessed with the idea of having friends over (without their parents. She hates when I'm friends with the parents) or going to other people's houses All By Herself. So, two weeks ago I made a deal with her. If she could keep her playroom tidy for a week, we could invite a friend round after school. I didn't think she'd manage it, but she did. Every evening before bed she took me into the playroom so I could see it was still tidy. Everything she played with was put away neatly before bedtime. So we invited her friend round. Ebony managed to keep the playroom tidy in the four days leading up to that as well, much to my amazement. The day of playing was yesterday. Her friend came after school, Ebony was so excited that had there been walls lining the way home from school she would have been bouncing off them. They played dress up, they played sisters (this is a game, apparently), they giggled, they whispered, they had a ball. And when her friend left, Ebony immediately started tidying up the room again (so she can 'have another friend around next week too'). So, there you have it. The playroom that has been the bane of my life for all of these years is now the tidiest room in the house. I need to up my tidying game before she realises and goes on strike on account of the fact that my office looks like a bomb has hit. Now that the room is tidy, I've been thinking of ways to make it nicer. 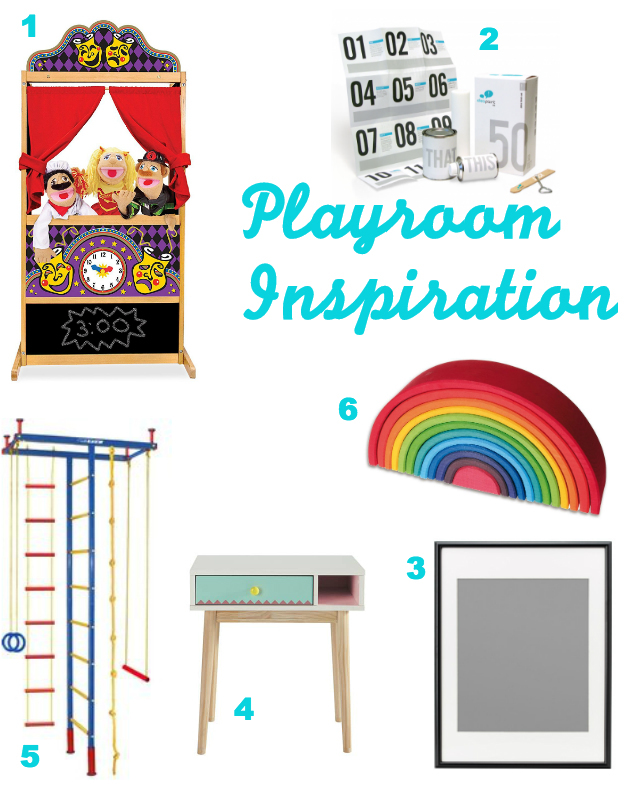 It's not exactly easy to make a playroom look pretty. Some of the toys are big and bulky and take up too much space. We have shelves in the alcoves on either side of the fireplace and these are filled with toys, so that makes it look a little neater than it would otherwise. My dad made Ebony a storage rail for her dressing up clothes. It's big and pink and filled with all the outfits and accessories a girl could need. She loves dressing up and putting on shows. There's a bay window in the playroom and I keep thinking that if I hung some red fabric across it, we could make it into a makeshift stage. But then I'd have to watch even more shows so I'm not sure that's the best idea.